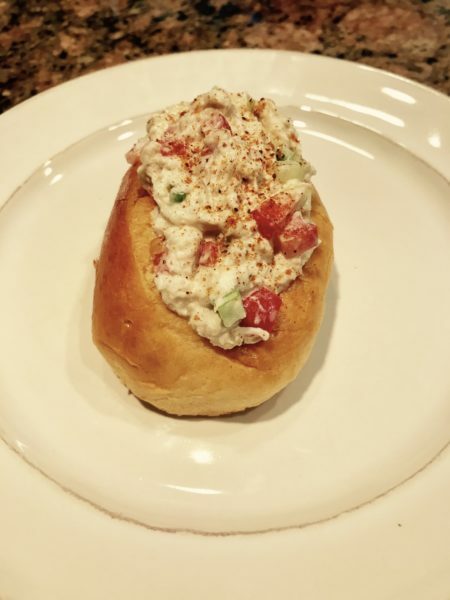 When you've returned from your New England vacations, or are just dreaming of one, like me, here's a way to satisfy that Lobster Roll craving, all available at our local grocery store and farmer's market. In a medium bowl, comb through the crabmeat to remove any shell pieces. Once that's done, squeeze with the lemon juice and mix. Let sit while you cut the veggies. Add the veggies and the rest of the ingredients (except the brioche) and combine. This shouldn't need any more salt, but feel free to season with both salt and more pepper if necessary. Cut a hole in the roll, or slice it open, add a big scoop of the salad. Sprinkle with more Old Bay.